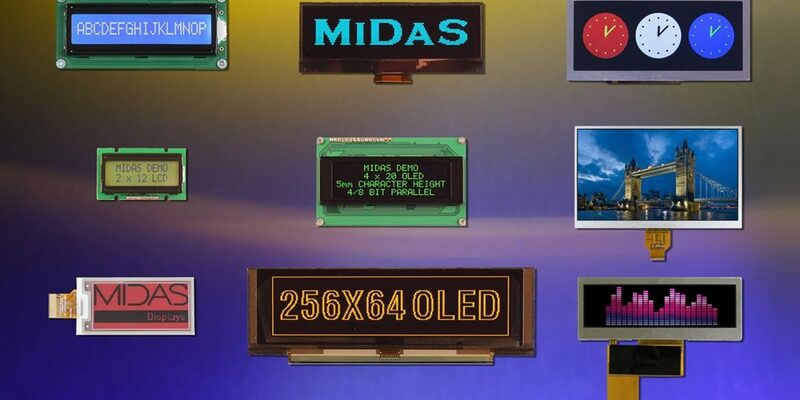 New TFT products to be exhibited by Midas Components at Southern Manufacturing & Electronics 2019 will include HDMI TFTs, and new transflective panels for outdoor use. Standard RGB and Mono devices, will be demonstrated alongside display enhancement products such as cover glass, multi-touch capacitive and RMTS touchscreens. New E-Paper displays, which maintain an image even when the power source is removed, complement the company’s traditional LCDs and OLEDs, which include mono and RGB OLEDs, VA technology LCDs, high resolution graphic LCDs, and alphanumeric LCDs. The company provides comprehensive technical assistance, dedicated to servicing a product development, working closely with a customer to find the best solution for specific applications. This is supported by a wide range of interface, interconnection, and driver board products, designed to work with industry standard processors and controllers such as Raspberry-Pi, UC32, and Arduino. The technical team offers full on-site demonstration capability to reduce the project concept stage. The UK-based engineering team can then support the chosen product evaluation time by supplying full technical support including the all-important initialization code. The company says its aim is to minimise customer time and effort in realising a new product and presenting it to an end market. The company offers over 700 lines through distributors Farnell, RS Components, Rapid, making availability for prototyping and low volume production easy.